With Hilton, you know you can expect a quality hotel experience and the Hilton Hotel in Kensington does not disappoint. If you are looking for a hotel in south west London then this Kensington is a natural choice as it is brilliantly situated near the famous museums and the river Thames. The Hilton London Kensington is a 4-star hotel in central London run by the global hotel group, Hilton. The modern hotel is situated a 5 minute walk from Holland Park (map at the bottom of this page) and boasts a good restaurant and relaxing lounge bar for guests to enjoy. If you are looking for the perfect place to stay on your London city break then look no further than the Hilton London Kensington hotel. 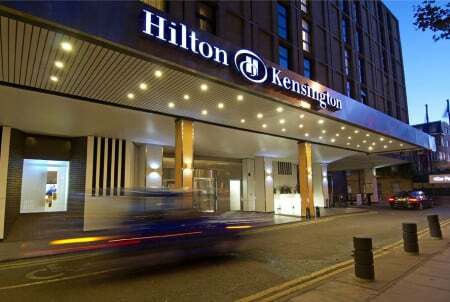 You can get to the Hilton London Kensington hotel from Heathrow in by taxi in 45 minutes and by public transport in under an hour. If you are traveling from within the UK then please use the Google Map on this page to help plan your journey. You can also get to Kensington from major UK train terminals such as Euston, Kings Cross and St Pancras International. You can plan your journey with CityMapper (search in the iOS or Android app store to download) or with Google Maps. If you decide to take a taxi from the Airport then you can pre-book an iconic black cab with an app called Gett or you will find taxi’s waiting at a rank outside the airport. To save money on this trip, you can compare travel prices with other services such as Uber and Addison Lee. Restaurant, lounge bar, 24-hour room service, air conditioning, laundry service, free wifi, en-suite rooms, mini-bar. If you are looking for a place to relax with friends, family or colleagues then head to the Avenue Bar & Lounge that is in the lobby of this hotel. They serve an A La Carte menu throughout the day with tasty food and a wide selection of drinks in the lounge. Those in search of a restaurant don’t have to look far as the hotel is home to the Westleven restaurant that serves a breakfast buffet in the morning and a delicious menu for lunch and dinner until 10pm. A short walk to Westfield means that you are in shoppers paradise as well as an extensive selection of bars and restaurants to choose from. See what is on offer on the Westfield website here. You can check in to Hilton London Kensington at 3pm (15:00). You need to check out of the Hilton London Kensington before midday (12:00).